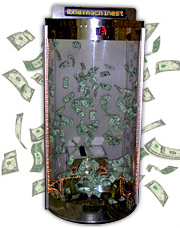 Companies throughout the U.S are using the Blizzard of Dollars™ Money Blowing Machine to raise the excitement and energy levels at trade shows, business meetings, grand openings, and marketing events. Crowds gather round to cheer on the lucky contestant inside the Money Blowing Machine grabbing wildly in the air to try and catch the swirling dollars inside. The event is as exhilarating for bystanders as it is for participants! Fill the Blizzard of Dollars™ Money Blowing Machine with currency, coupons, or customized paper bills redeemable at your store only. The Blizzard of Dollars™ Money Blowing Machine is available in three different fun styles to suit every company’s budget! ADVANCED MONEY CIRCULATION TECHNOLOGY! The Blizzard of Dollars ™ Money Blowing Machine offers advanced wind circulation technology, designed by a team of expert aerodynamics engineers. This proprietary technology prevents dollars from piling up on the floor of the Money Blowing Machine – a common issue in cheaper competitor models. Our Blizzard of Dollars ™ hard case money machines are designed with portability and durability in mind. Blizzard of Dollars ™ rentals as low as $795-$1245! 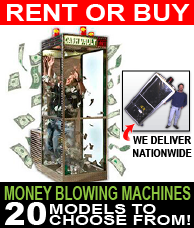 Money Machine rentals based on availability – call for details. 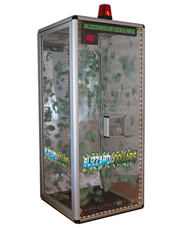 Our portable and lightweight Blizzard of Dollars™ Money Blowing Machine is designed for travel! It’s so portable you can fit it right in the trunk of a car. Sturdy carrying case finished with brushed aluminum. Customizable rigid signboard panels allow you to promote your 4-color logo on all three sides. 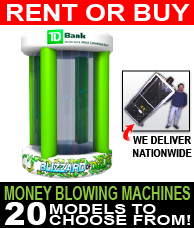 Buy the Traveler Blizzard of Dollars™ Money Machine New For Only $2995.00 plus shipping and handling! it can fit in a car! Blizzard of Dollars™ Money Grabber Jr. 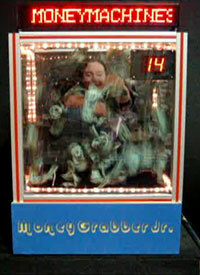 Enjoy the functionality of a full size Cash Cube Money Blowing Machine with the Money Grabber Jr.! 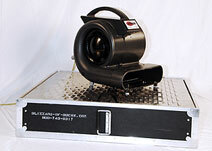 This tabletop Money Blowing Machine is ideal for small trade show booths and for those on a limited budget. 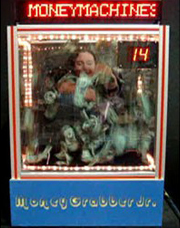 Money Grabber Jr. includes a fun digital timer and flashing lights that grab the attention of crowds. This Money Blowing Machine is so portable that it can be shipped straight to your door via UPS! Dimension: 32" x 32" x 30.5"
We customize 3 sides of the Money Grabber Jr. with your four-color logo and text with rigid, lightweight sign board. With a Blizzard of Bucks cash blowing machine you can create public awareness for your business. A cash cube (money machine or money blowing booth, as some people call it) is fun way to distribute cash or coupons at an event. A Blizzard of Bucks cash cube or money machine is a great draw at trade shows, casinos, racetracks, banks, malls, radio stations and auto dealerships to name a few. 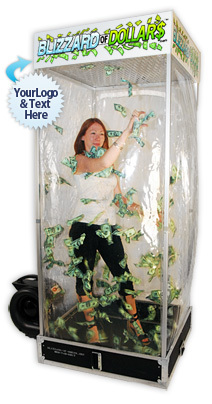 An inflatable cash cube or hard case money machine (money machine or money blower, as some people call it) is fun way to distribute cash or custom imprinted coupons and vouchers at an event. A Cash Cube or Money Machine is a great draw at grand openings, holiday sales, parties, picnics, employee, customer appreciation days, and so many other types of events. 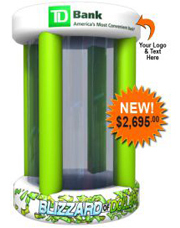 Few promotional products have the versatility and allure of the Money Booth Machine & Inflatable Cash Cubes. 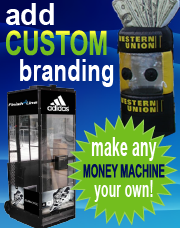 And we at Money Machine 4 Rent consider the money machine to be Ranked #1 as the Ultimate Promotional Tool! 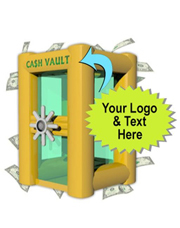 $ Auto Dealership Promotions: Auto Dealerships and Car Lots have an excellent promotional opportunity with the Money Booth Machine or Inflatable Cash Cube. Imagine each purchaser of a New Car getting to step into the Cash Cube, or prospective buyers being allowed to grab their down payment in Dealer Dollars or Special Purchase Coupon Dollars prior to a purchase. Learn more about automotive marketing dealership promotions. Click Here. $ Bank Promotion: Banks can began targeting for new account holders with the “cash cube money machine,” with their banks branded portable enclosed booth in which customers spin the Blizzard of Bucks wheel of chance to win a chance to enter the booth and try to grab as much specially custom printed bank dollars as they can in a 25-second period. “There is about $2,500 swirling in the air around them, and they can keep whatever they catch when they open up a new checking account and deposit their catch into their new account. Its a win win situation for the new account holder and the bank! Learn more about bank marketing promotions. Click Here. $ Casino Promotion: Entice entertainment-goers to patronize your casino and keep them there longer with the allure of winning the thousands of dollars swirling around in the Cash Cube Money Machine. Casinos from coast to coast are incorporating the Cash Cube Money Machine into their marketing and promotional events, using its power to draw crowds, increase casino member club sign-ups, and keep customers in them gambling in your casino longer as they eagerly await the hourly drawing that reveals the name of the lucky winner who will step inside. Read more about how casino marketing managers are using the Cash Cube Money Machine and other promotional products in their casino marketing promotions to drive crowds and boost revenues and retention rates. 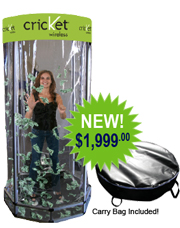 $ Trade Show Promotion: Make your booth the main attraction of the show with a Money Booth Machine & Inflatable Cash Cube. The sheer spectacle of swirling money or special purchase coupon dollars and dazzling lights is a guaranteed traffic builder. 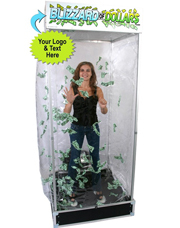 If your trade shows promotions lack excitement the Money Booth Machine or Inflatable Cash Cube is sure way to bring your event to life. 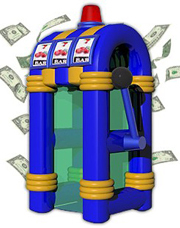 $ Grand Openings: Business promoters know Money Booth Machine & Inflatable Cash Cubes are an absolute necessity at Grand Openings. The excitement of man verse machine and the allure of the swirling money guarantee’s an exciting carnival like atmosphere. And there is never a better opportunity to stimulate sales then by using Co-Op Mall Dollars, Special Purchase Coupon Dollars, or Store Bucks in addition to cash. 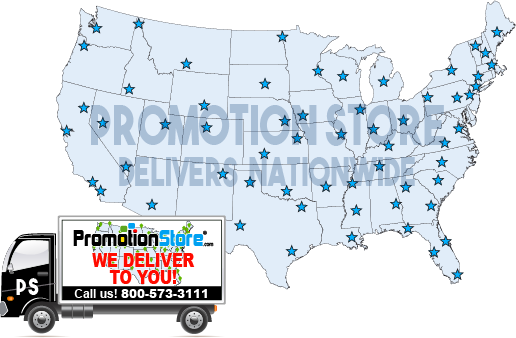 $ Product Sale Promotion: Product promotion is not limited to just automotive dealers. 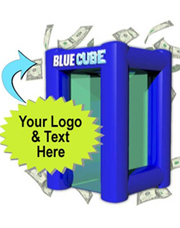 The Money Booth Machine or Inflatable Cash Cube offers nice purchasing incentives to virtually any mid to high range product. 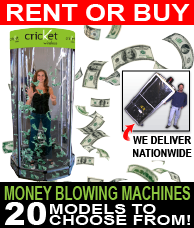 Appliance Dealers, Electronics Stores, Home Improvement Centers all would benefit from periodic Money Booth Machine or Inflatable Cash Cube rentals. $Fund Raisers: As with employee incentive programs fund raising events are an excellent rental promotional source. So many groups are turning to fundraisers to generate dollars for their bottom lines or for special causes. Are your donors tired of buying trinkets that they rarely use, or candy that they don’t need? If you are in charge of a fundraiser, spice things up and bring in The Money Booth Machine or Inflatable Cash Cube. Get your participants excited and enthused about your cause… when they are excited, your organization benefits from their enthusiasm. Incorporate The Money Machine into your fundraiser, whether it’s for your school, community group, church, or other organization. Turn a mediocre fundraiser into a FUNdraiser. Increase the desire to give more as participants win more. $ Redemption Centers: Often over looked is the Family Fun Center or Vending Amusement Parlor. When stuffed with redemption coupons the Money Booth Machine & Inflatable Cash Cube is a real inducement for game players. Casino and Riverboat Events: A natural attraction for the gambler, the Monte Carlo or money booth cube will draw a crowd to any gaming parlor event! $ Corporate Events: While cash cubes have long been a standard attractions at annual corporate events, more companies are finding them to be just the ticket to put a little excitement in their weekly and monthly sales meetings as well. A chance to enter one of our Money Booth Machine & Inflatable Cash Cubes is an excellent employee incentive to bring in new clients, push new product sales, or beat last month’s sales figures. 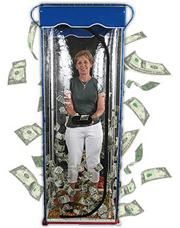 $ Employee Promotions: Entice employees to be more productive with incentives from The Money Booth Machine & Inflatable Cash Cube. Fill the machine with money, rewards, incentives and/or time off coupons… the choice is yours. Create excitement in your workplace and reward excellence. While The Money Booth Machine & Inflatable Cash Cube is at your company, invite employees and their families to a special company party. 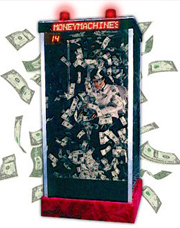 Invite kids and adults alike to take a chance at winning in The Money Machine. Watch workplace morale increase as well as productivity and sales. Typical Applications for Money Booth Machine and Inflatable Cash Cubes! We are eager to work with you and exchange ideas. Let us e-mail or fax you a sample non-binding proposal detailing some of our packages and the benefits and savings we can extend to you by working with us! It's easy; just call us or click here for our contact us page.